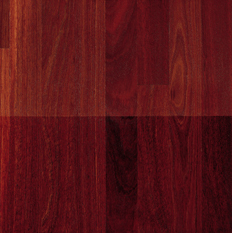 Color: Heartwood is uniformly pinkish to dark red, often a rich, dark red mahogany hue, turning a deep brownish red with age and exposure; sapwood is pale. Frequent black streaks with occasional ingrown grain. Grain: Frequently interlocked or wavy. Texture is even and moderately coarse. Hardness/Janka: 1910; 48% harder than Northern red oak. Dimensional Stability: Below average (change coefficient .00296; 7% less stable than red oak). Durability: Dense and very strong; high resistance to wear. Sawing/Machining: Difficult to work because of high density and irregular grain; carbine tooling recommended. Sanding: Sands well, but dust can strain fabric and wall treatments. Finishing: Red color can bleed into some finishes - a problem when mixing species. Comments: Resistant to termites and fungus.